A local election row has blown up following a claim that a plan has been hatched between UKIP and an Isleworth Labour councillor to "split" the vote to prevent a community group winning Council seats. Labour councillor Sue Sampson of Isleworth ward says the allegations made by Phil Andrews of the Independent Community Group (ICG) are "a complete and utter fabrication". Former councillor Phil Andrews says The United Kingdom Independence Party (UKIP) is standing three candidates in Isleworth ward as part of a bid to block his group from regaining the ward from Labour. He claims that two of the UKIP candidates are Labour supporters and friends of Sue Sampson who have no political affinity with the party they are claiming to represent. Phil Andrews stated on his blog, "their friendship with a serving ward councillor has led to them agreeing to participate in a con-trick being performed by the local Labour Group on the voters of Isleworth ward." The ICG will be contesting seven seats - three each in Syon and Isleworth and one in Brentford in a bid to regain seats they lost at the 2010 election. Cllr Sampson, who has also posted her comments on the BrentfordTW8.com forum said Mr. Andrews was "clutching at straws." One of the UKIP candidates Kelly Adams, has rejected the "vote-split" allegation and has posted a reaction to Mr. Andrews on the forum - "I don't need to stand to split any vote as you call it - even without me standing you wouldn't have won - the people of Isleworth have lost faith in you". The UKIP leader in the borough, Cllr Colin Botteril, who is running the election campaign for the party said ; “There is no deal between UKIP or Labour or anyone else in this election”. He said Mr. Andrews was trying to discredit candidates and was “playing games”. A previous UKIP candidate, David W Griffiths, had been deselected from the party after it was disclosed that he had previously stated that he was the 'Anti-Christ' and that homeless people should be shot in the streets and homosexuals should be banished to an island. He remains on the ballot as an independent. Local election observers have said the row has the potential to destablise the election in the borough. The Council has currently a Labour Party majority with the breakdown at Labour 35 seats, to 25 (20 Conservatives, 1 Independent and four UKIP). Labour has recently suspended Cranford ward candidate Gurpal Virdi from representing the party pending the outcome of a court case next month. Between 1998 and 2006 Independents were elected to the London Borough of Hounslow from the area. 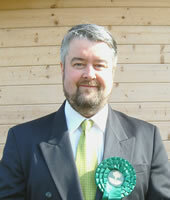 The first Independent Community Group (ICG) Councillor was elected in 1998 as Isleworth Community Group in Isleworth. In 2002 three ICG Councillors were elected in Isleworth. In 2006 six ICG Councillors were elected (Syon and Isleworth wards). All the independents were defeated in the local elections held on May 6, 2010 by Labour Party candidates. Since then one Conservative councillor has become an Independent and four Conservative Councillors have defected to UKIP.